“4. Run really fast every once in a while. And when he says “short,” he means it. The idea here is to go as hard and fast as you can for about 10-15 seconds. Then rest a little and repeat as many times as you can with good form. Including warming up and cooling down, this whole activity will take only about 15 minutes. So far, I’ve adapted this law and the one before it (lift heavy things) to my swimming workouts. During each one hour session, I do about a dozen push ups on the side wall of the pool, and also about a dozen pull ups on the diving board. Every other time I swim, I “sprint” in the pool by swimming as fast as I can, pretending I’m being chased by a shark or something, for half the length of the pool, which takes me about 15 seconds. Then I rest floating on my back until I get my breath and do it again. Usually 4-6 of those sprints is as many as I can do. 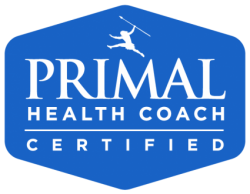 One of the things I love about the Primal program is that it is very flexible and adaptable. The materials all suggest that you start slow and take it at your own pace. The most important thing is to start moving. Have you done that yet?